Anyone who's ever tried going on a low carb diet knows that cauliflower makes a great substitute for plenty of carbs. It can be used as a substitute for pizza dough or take the place of pasta, and as the recipe that follows shows, it can even be used instead of potatoes. When you really step back and examine the almighty cauliflower, it leaves you wondering if there's anything it can't do. This recipe is ideal if you ever crave loaded baked potatoes but want to stay true to your low-carb diet. Cauliflower gets a quick steam before being covered in cheese and then going into the oven for just a few minutes. When it comes out, it gets topped with cooked bacon, green onions, sour cream, and anything else you love on your baked potato. Fill your craving without busting your waistline! Preheat oven to 400 degrees Fahrenheit and grease a 6" x 6" casserole dish. Place two inches of water into a large saucepan. 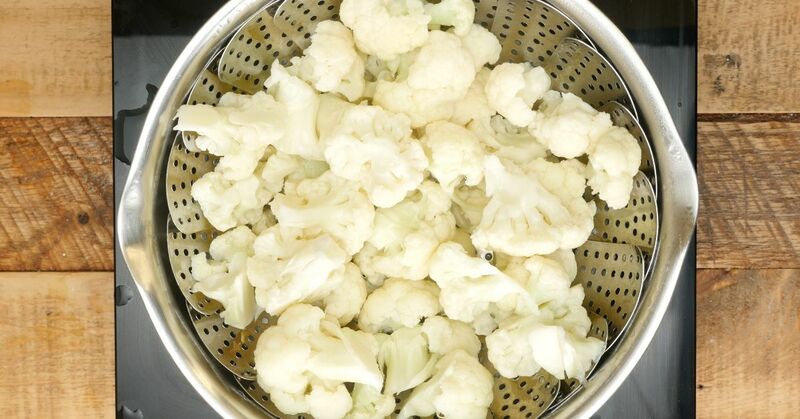 Add a steamer basket and place the cauliflower florets into the basket. Place the saucepan onto a burner and cover with a lid. Heat to high and allow the cauliflower to steam for about 5 minutes until crisp-tender. While cauliflower is steaming, start preparing the bacon. Place the chopped bacon into a frying pan and set over medium heat. Cook, stirring regularly, until bacon is crisp and fat has rendered, about 7 minutes. Remove to a paper towel to drain. When cauliflower has finished steaming, place into the prepared casserole dish and sprinkle with cheese. Place cauliflower into the oven and bake for 5 to 10 minutes, then broil on high until golden. 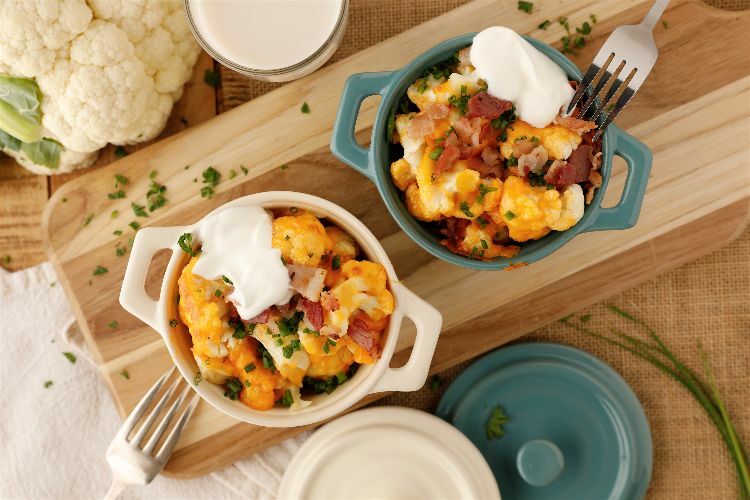 Remove cauliflower from oven and sprinkle with cooked bacon and green onions. Add dollops of sour cream to the top of the cauliflower just before serving.